From June 7th to 9th, Yasuo Fukuda, Prime Minister of Japan hosted a meeting of G8 leaders in Toyako, Hokkaido. Heads of all the Group of Eight Nations, including U.S. President George W. Bush, joined the three-day summit at a hotel near Lake Toyako. In addition to the G8 chiefs, meetings were held with leaders of African states and emerging industrial powers like China and India. 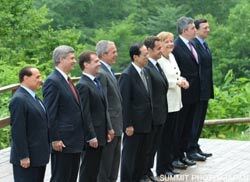 Individual programs were also arranged for the spouses of the G8 leaders. 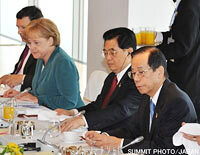 Members of the G8 conducted intensive discussions about how to tackle pressing global challenges. Among the significant issues on the agenda were the world economy, the environment and climate change, development, Africa, and various political issues. Reflecting on the global economy, the G8 leaders expressed a positive perspective about the long-term resilience of the world economy and future global economic growth. At the same time, they expressed strong concern about elevated commodity prices, especially of oil and food, which increase global inflationary pressure. They reaffirmed their determination to continue to take appropriate actions to ensure stability and growth in the world economy. On rising oil prices, the G8 leaders stressed the necessity of concerted efforts for the increase of production and refining capacities, the expansion of upstream and downstream investment, and the improvement of energy efficiency and energy diversification. As for increasing global food prices, they affirmed their intention to achieve significant increase of aid and investment in the agricultural sector. In the field of trade and investment, the G8 leaders expressed their hopes for a successful conclusion of an ambitious, balanced and comprehensive WTO Doha agreement, and they confirmed their determination to work urgently toward the conclusion of the negotiations. With 2008 marking the mid-point of the U.N. Millennium Development Goals, development, especially African development, was a key theme. In their discussions, the leaders renewed their commitment to these goals by reinvigorating efforts and by strengthening the partnership with developing countries based on mutual accountability. They also firmly committed to working to fulfill their commitments on ODA made at the Gleneagles Summit (2005) and reaffirmed at the Heiligendamm Summit (2007), including an increase of ODA of all donors to Africa by U.S.$ 25 billion a year by 2010. They welcomed the important contributions of TICAD IV, which was co-hosted by Japan in May, and they agreed to reflect the views of African partners in future cooperation. The G8 leaders also discussed key political issues like non-proliferation, transnational organized crime, and peacekeeping/peacebuilding. They also issued individual statements on Zimbabwe and counter-terrorism. In discussing non-proliferation, they expressed their continuous support for the Six-Party process towards the verifiable denuclearization of the Korean Peninsula and the eventual normalization of relations between the relevant Six-Party members through the full implementation of the Joint Statement of 19 September 2005, including the resolution of the outstanding issues of concern such as the abduction issue. At a press conference on July 9th, Prime Minister Fukuda stressed the importance of this Summit and highly evaluated its outcomes by calling the three-day work of world leaders very serious and productive. 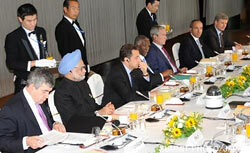 The Toyako Summit was also host to many bilateral meetings. 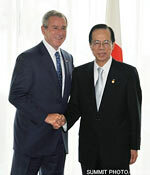 On July 6th, Prime Minister Fukuda and President George W. Bush held talks for an hour-and-a-half. The two leaders exchanged views on a variety of issues including strengthening the Japan-U.S. alliance, the situation in North Korea (including the abduction issue), climate change, Asia, Africa, disaster prevention, Afghanistan, and the world economy. Both leaders affirmed their intention to work to develop mutual cooperation on each of these important issues. Climate change was a key agenda item at the recent G8 Hokkaido Toyako Summit. With the effects of global warming beginning to be felt around the world, there is a consensus that this issue must be addressed before posing a serious threat to future generations. A month prior to the summit (on June 9th), Prime Minister Yasuo Fukuda gave a speech stressing the need to halve global CO2 emissions by the year 2050 to create a low-carbon society. 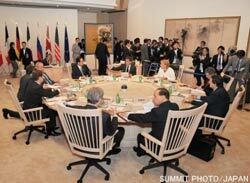 Mr. Fukuda’s goal was intensively discussed by world leaders during the G8 Hokkaido Toyako Summit. At their meetings, the G8 leaders shared with all parties to the UNFCCC (United Nations Framework Convention on Climate Change) the goal of achieving at least a 50% reduction of global emissions by 2050. Such a global challenge can only be met by a global response, in particular, by contributions from all major economies, and consistent with the principle of common but differentiated responsibilities and respective capabilities. In this regard, on July 8th G8 heads expressed their desire to discuss the issue with leaders of other major economies and to continue discussions among the major economies and in UNFCCC negotiations over the coming months. Accordingly, on July 9th, the leaders of G8 and 16 major economies including China and India held a two-hour Major Economies Meeting (MEM) in which all participants discussed the issue and agreed to take further actions to strengthen the framework against climate change. 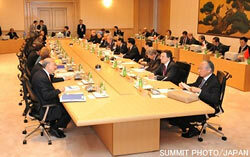 A proposal by Prime Minister Fukuda to continue MEM at next year’s summit in Italy was adopted. Making progress towards this shared vision and long-term global goal will require mid-term goals and national plans to achieve them. In this respect, the G8 leaders expressed their intention to implement ambitious, economy-wide mid-term goals in order to achieve absolute emissions reductions. They stressed the importance of stopping the growth of emissions as soon as possible to reflect comparable efforts among all developed economies and taking into account differences in national circumstances. The leaders also recognized that the sectoral approach, which focuses on determining optimal energy use within each industrial sector, can be a useful tool to improve energy efficiency and reduce greenhouse gases emissions through dissemination of existing and new technologies in a manner compatible with economic growth. The G8 leaders welcomed and supported the establishment of the Climate Investment Funds (CIF) including the Clean Technology Fund (CTF) and the Strategic Climate Fund (SCF), administered by the World Bank. The CTF will promote low-carbon economies by helping to finance deployment of cleaner energy technologies in developing countries. The SCF will help more vulnerable countries develop climate-resilient economies. Looking ahead to a post-2012 climate regime, the G8 leaders stressed the importance of reaching a global agreement by 2009 in the United Nations Framework Convention on Climate Change (UNFCCC) process. 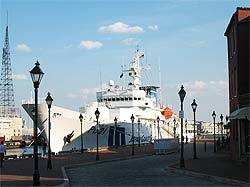 The Japan Coast Guard training vessel “Kojima” visited the Port of Baltimore from June 20-25, 2008, as part of a three month deep-sea training exercise. The Kojima carries a total of 89 passengers, with 46 crew members and 43 postgraduate cadets from the Japan Coast Guard Academy. The Kojima departed from Japan in mid-May and will have visited Tokyo, Honolulu, Baltimore, Marseille, Monaco, Singapore, and Manila at the end of this training cruise. The purpose of this exercise is not only to provide the necessary knowledge and technical training for the Japan Coast Guard officers, but also, by visiting foreign ports, to provide the Japan Coast Guard with an opportunity to gain greater insight into international affairs and promote international friendship. The highlights of the Kojima’s visit to Baltimore included a welcome ceremony; a reception and public tour on board the Kojima; and visits by the cadets to the U.S. capitol, U.S. Coast Guard headquarters, and the U.S. Coast Guard Sector Baltimore facility. The welcome ceremony was held on June 20th and was sponsored by Sail Baltimore, a non-profit organization that provides a free, annual, public program of visiting ships and maritime events. Attendees at the welcome ceremony included officials from the U.S. Coast Guard, the Navy, the State of Maryland, the City of Baltimore, and the Maryland Port Administration. 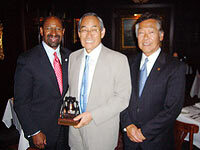 Officials from these organizations, as well as distinguished members of the Japanese business community, also attended a reception held on board the Kojima on June 24th. Nearly 120 participants enjoyed the company of the guests and various educational and cultural activities. These activities included a Japanese meal, a tea ceremony, demonstrations of Kendo (Japanese fencing) and Taiho Jutsu (control and restraining techniques used by law enforcement), and a performance of traditional Japanese musical instruments by the cadets. 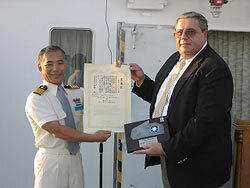 During the reception, an award ceremony was also held to present the Rescue Commendation letter and plaque to crew members of the Shrike Cargo Ship, who helped six fishermen escape from a burning Taiwanese fishing boat south of Miyako Island in Japan after receiving a rescue request from the Japan Coast Guard. Mr. Brian Bittner, of Eagle Shipping International, accepted the letter and plaque from Kojima Captain Sakiyama on behalf of the Shrike’s crew members. 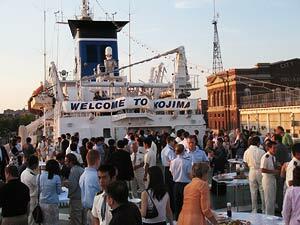 Many of the guests at the reception expressed their gratitude for the Kojima’s outreach efforts. The Kojima’s crew and cadets also were grateful for their warm reception in Baltimore. Their visit was a valuable opportunity to deepen mutual understanding and cultural exchange between Japan and the U.S.
Summer vacation means summer reading. So now is the perfect time to explore the fantastic worlds of one of Japan’s most popular and critically acclaimed novelists, Haruki Murakami. Readers in Japan and fans of literature around the globe have long been captivated by Murakami’s strange and surreal tales. His best-known books like "Norwegian Wood," "A Wild Sheep Chase," "The Wind-up Birds Chronicle" "Sputnik Sweetheart" and "Kafka on the Shore" have been translated from Japanese into scores of languages. In addition to being a recipient of many prestigious literary prizes, Murakami is cited as a perennial favorite for a Nobel Prize. Murakami’s work has been described by critics as “easily accessible, yet profoundly complex.” So no matter how strange the journey, you are sure to keep turning the page. Murakami’s typical protagonists are "everyman" types who are indifferent to worldly success. Murakami cracks the reality of their ordinary lives and plunges them into worlds where the boundaries between life and death, reality and dream are no longer clear. Murakami’s extraordinary (and often absurd) worlds feel familiar to us, since they point to the basic questions we all face: "What am I?”"and "What is the ultimate meaning of existence?" Philosophers -- and indeed most of us -- have pondered the contradictions of life and death, existence and nothingness. Murakami doesn’t provide definite answers, but rather, he leads his characters and his readers to a place where language itself loses meaning before such timeworn questions. But just before reaching the point of no return, Murakami returns his protagonists to their "real" lives with a refreshed readiness to live them. Murakami’s cast of unforgettable supporting characters is one of the most remarkable aspects of his books. One good example is Mr. Nakata in "Kafka on the Shore," a man who mysteriously loses his intellectual functions in childhood and cannot read or memorize, but who can communicate with cats. 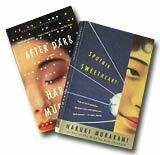 Another is young Sumire of "Sputnik Sweetheart," an aspiring novelist who disappears, leaving behind only a computer disk with "Document 1" and "Document "”, clues that become the central theme of Murakami’s existential explorations. Murakami is a master at using language and metaphor to call into question the nature of reality. His books are metaphysical page-turners that lift the veil from our ordinary lives to reveal the big questions lurking just behind the everyday. So why not take a trip into the universe of Haruki Murakami this summer? You may never see things quite the same again. Japan is at the epicenter of today’s worldwide manga (comics) craze. But you may be surprised to learn just how far back in history the genre spans. Osamu Tezuka (1928 -- 1989), creator of Astro Boy, is often called “the father of manga” for his innovative techniques and influence in the field. Going further into the past, there are even manga drawn by Hokusai Katsushika, the celebrated Edo-era ukiyoe artist (1760 -- 1849). But the roots of manga can actually be traced back centuries. It is generally acknowledged that Japan’s first manga was the Choju Giga (“The Scroll of Frolicking Animals”), a set of black and white scrolls of the Kozan-ji temple in Kyoto, and now considered a Japanese national treasure. The creation of the scrolls began at the end of the 12th century, a period marked by the transition from Heian-era aristocracy to the Kamakura era’s emerging samurai class. The Choju Giga scrolls are large scale masterpieces. The first three are 38 to 39 feet long, and the fourth (the shortest) exceeds 30 feet. The first scroll depicts animals like rabbits, frogs, monkeys, foxes, and cats acting with human traits. The second scroll illustrates not only real animals but also fantastical creatures like dragons. The third and forth scrolls describe the lives of people in those years. Animals with human personalities appear again in the second half of the third scroll. The first scroll with its charming scenes of animals washing themselves in a river, holding sumo matches, and even engaging in an archery contest is the most famous. A sumo scene in which a frog expertly throws a rabbit is especially liked by the Japanese -- who are always sympathetic to the underdog. The depictions are a poignant satire of the human world as the animals ardently devote themselves to gambling, arrogantly ruling other animals, and putting on airs. Each animal is drawn with an expressive face, and some are drawn with “speed lines”, a technique to indicate motion that remains typical of manga, even today. The creator of the scrolls is not known. It is possible that they were not drawn by a single artist, since they include several different styles of drawing. However, a priest known as Toba-sojo Kakuyu (1053--1140) is generally believed to have been involved in their creation. He was a high ranking priest who occupied an important post in Buddhism at that time. He was also known to have been skilled at drawing pictures. History reminds us that he had a personality straight out of a comic. One anecdote recounts that, preparing his will for his disciples before his death, he instructed them to arm wrestle to determine how to divide his legacy. It has been a busy and eventful July. First and foremost, Japan hosted a major annual gathering of world leaders in northern Japan, the G8 Hokkaido Toyako Summit. As Prime Minister Fukuda pointed out at the event’s press conference, the meeting comes at a critical time. Around the world people are feeling the effects of problems like global warming, soaring oil and food prices, and declining financial markets. In these trying circumstances world leaders gathered to conduct vigorous discussions about how to best meet these challenges. Their talks yielded many significant results, including a shared understanding of the necessity to set a long-term goal for a reduction of global emissions. Such positive outcomes were only first steps; they must be followed by many more. But it is important that world leaders, on the basis of joint cooperation and joint commitment, created a groundwork for further dialogue about how the world community should move forward. The Japan-US bilateral meeting between Prime Minister Fukuda and President Bush, held as a sideline to the summit, was another integral part of the success of the Toyako gathering. It was crucial because the United States and Japan, as the world’s two biggest economies, must work together on the basis of our close partnership. For example, the health of the US economy will decisively affect the global economy. And it also widely recognized that the alliance between Japan and the U.S. is fundamental to the overall peace and stability of the Asia Pacific region. A strong Japan-U.S. partnership will help promote peace and stability in the world community -- the ultimate goal of the annual G8 summits. Closer to home, I had the pleasure to take part in an important “summit” myself when I traveled to Philadelphia to meet with Mayor Michael Nutter, and Mr. Dennis Morikawa, Honorary Consulate General of Japan in Philadelphia. It was excellent to meet with my friends from Philadelphia and it was a great chance to touch on various issues of cooperation and mutual interest shared between Japan and the City of Brotherly Love. silk. 31 1/2 x 47 1/4 in. Tapestry in Architecture: Creating Human Spaces is the first in a new series of short, small-scale summer shows at Japan Society, offering an intimate look at specialized subjects, private collections, and nontraditional media. Tapestry in Architecture features the work of Mitsuko Asakura, an artist well known for her innovative combination of Japanese traditional dyeing and weaving with the techniques of Western tapestry. This premiere U.S. exhibition of her textile work highlights intricately woven, delicately patterned fabric specifically designed to compliment architectural interiors. The exhibition showcases 12 hanging pieces replete with photos and a video essay depicting the creative process. The daughter of an artist and dyer, Asakura was born and raised in Kyoto, the former capital of Japan. While growing up, Asakura developed a passion for weaving as she helped her father in his workshop and was surrounded by traditional craft artists. Deeply immersed in the traditional textile culture of Japan, she created her own original style of textile art by mixing traditional fiber dyeing with experimental shapes. Asakura’s tapestries are noted for their subtle use of color and unusual forms. All of her dyes are handmade, often featuring a combination of natural ingredients taken from the natural surroundings of Kyoto and cutting-edge chemical substances. The interplay of the natural and man-made materials in the dye creates vibrant yet subtle colors that distinguish her work. Following Tapestry in Architecture’s debut at Japan Society, it then travels to Harvard University’s Reischauer Institute of Japanese Studies in Cambridge, Massachusetts, the Morikami Museum and Gardens in Delray Beach, Florida and the American Institute of Architects Headquarters Gallery in Washington, D.C. It was organized to be part of a year-long celebration of the 30th anniversary of the National Association of Japan-American Societies (NAJAS), a private, non-partisan organization that is the only national non-profit network in the U.S. dedicated to public education about Japan. $5; students & seniors $3; Japan Society members and children under 16 free. 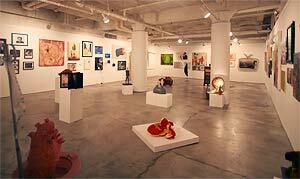 The 4th Annual Art Exhibition in New York will be presented by the ISE Cultural Foundation from July 11 to August 30. All works received will be displayed at the ISE Cultural Foundation Gallery. This exhibition is open to all art students, offering them the rare opportunity to display their work in a Soho gallery. The unique aspect of this exhibition is how the pieces are evaluated. They will be judged by a panel of five art professionals composed of the Japan Society Vice President & Gallery Director Joe Earle, art critic Manami Fujimori and Noguchi Museum curator Bonnie Rychlak. However, unlike a typical prize system where first, second and third are designated, this exhibition will allow each judge to award a prize bearing his/her name to two works of his/her choice. In addition, there is a New York City Audience Award which will be determined by votes from those who come to see the exhibition. Last year, 120 entrants submitted 209 works of both sculpture and paintings; nearly double the total amount from the previous year. This year, there will be 120 artists, all who will submit one piece of artwork. In the past, many artists have used this event as a springboard to future success. For example, Cosme Herrera, winner of last year’s Natalie Ingres Award, has a group exhibition this year at a gallery in Noho. Also, Don Porcella caught the attention of a curator at the 2006 exhibition and went on to have an exhibition in Paris as well as a solo exhibition in Chelsea. In addition, he designed the award certificate for this year’s exhibition, which is supported by the Consulate General of Japan in New York and made possible by cooperation from UNIQLO Inc., SUNTORY International Corp., and New York Seikatsu Press, Inc.